D is for desktop. L is for laptop. M is for mobile. E is for expensive! For the time being, traditional technologies are too expensive and complicated to implement in scale, while also allowing sufficient funding for teacher training and learning materials development. Desktops in school computer rooms require a dedicated, secure classroom that would otherwise serve as an instructional space in an often-overcrowded school. The opportunity cost associated with losing an instructional space alone, is incalculable. Some initiatives adopt a “mobile lab” approach, where they introduce laptops – or increasingly, tablets – to provide students with 1:1 instruction, without losing instructional space. Another approach is mobile phone technology. Nokia recently announced a Linux-based smartphone for $100, and there have been announcements about Google-powered Android smartphones, also priced in the $100 range. Yet, the challenges with all three approaches remain more or less the same. First, there may never been enough computers and smartphones available (at least not in the foreseeable future) to adequately serve every student. Second, assuring the necessary maintenance of equipment, networks, and access to reliable electricity is a particularly expensive proposition when a nation considers equipping the majority of its schools. And finally, the responsibility placed on the individual teacher to effectively integrate technology into instruction is immense. He must be trained to facilitate use of high-quality software, facilitate student use, troubleshoot technical issues during facilitation, and monitor individual and collective student progress in order to achieve measurable goals – in addition to his regular teaching responsibilities! For technology that relies on the delivery of web-based content, there are even greater risks for abandoning use of computers altogether if the network is not fast or reliable enough, or if the cost is prohibitive over a longer period. 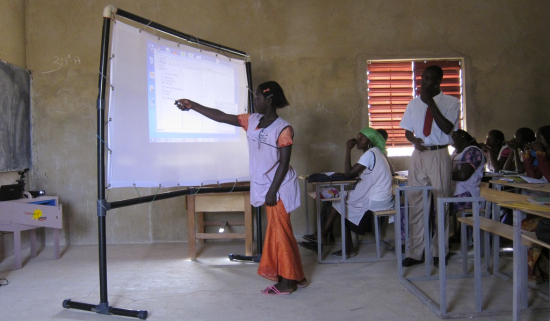 In partnership with USAID/Senegal and Columbia University’s Earth Institute, CyberSmart Africa has introduced a whole-class learning solution that integrates the use of a specially adapted interactive whiteboard directly into classroom instruction. We started the program in 2010 and now operate in three primary schools and six middle schools. The objective is to focus on learning, as teachers facilitate an active, student-centered classroom that integrates the use of digital resources in support of all core academic subjects. The whole class learns together as an interactive whiteboard moves between classrooms, impacting hundreds of students during a single school day. More than a dozen students will actually use the interactive whiteboard during a single class session, while all students become active learners as they benefit from the experience of observing and influencing their peers’ work at the board. Implementation is simplified and the Total Cost of Ownership is low compared to laptop and school computer room initiatives because there is less equipment to be maintained and managed; and there are minimal installation costs because all of the equipment is portable. Resources are primarily directed toward ongoing teacher training, the single investment in education that is most closely associated with student success. Many of the classrooms in our partner schools have rusted ceilings, and some lack electricity. Power is supplied with a solar-charged battery that moves between classrooms along with the equipment. The technology consists primarily of a lightweight screen manufactured in-country, a netbook, a low-power video projector, and an interactive “controller” that enables the touch-screen capability. Users interact with the computer – opening files, playing games, searching for content – by touching the screen with a special infrared pen that acts like a mouse. All the necessary software to run the applications resides in the stand-alone netbook, and Internet connectivity is optional. The equipment is easily moved between classrooms, over sand and sometimes even through the village to an off-site space, and can be completely set up in under ten minutes. In contrast to using a regular video projector, the teacher and students are not glued to a computer keyboard – which will most likely be controlled by the teacher – in order to manipulate desktop content on an interactive whiteboard. Lessons are purposely designed to be participatory, and viewable by the whole class so that students are more engaged in the learning process. Interactive whiteboard software also makes use of a suite of “blackboard-like” annotation tools – underlining, circling, coloring – among other capabilities. As ICT has become central to the USAID Education Strategy (February 2011), it is essential to keep in mind that ICT use in schools will accomplish very little if not integrated within a toolbox full of supporting educational content, ongoing teacher training and support, and a context that nurtures evolving teaching and learning styles. Our work at CyberSmart Africa has been motivated by the unfortunate reality of too many education initiatives who introduce ICT simply for ICT’s sake, and whose budget and program activities go to supporting only the use of the provided equipment. Our approach extends directly into the pedagogical implications of ICT; the bulk of our activities support the ongoing teacher training necessary to successfully integrate ICT to improve the quality of instruction, and thus impact student learning. Through our ongoing professional development activities, we support the teachers in a shift toward learner-centered strategies. The teachers gradually move away from the traditional lecture-style approach and become facilitators of the learning process. As part of our teacher professional development activities, we nurture professional learning communities where teachers support one another and create their own technology-integrated lessons. 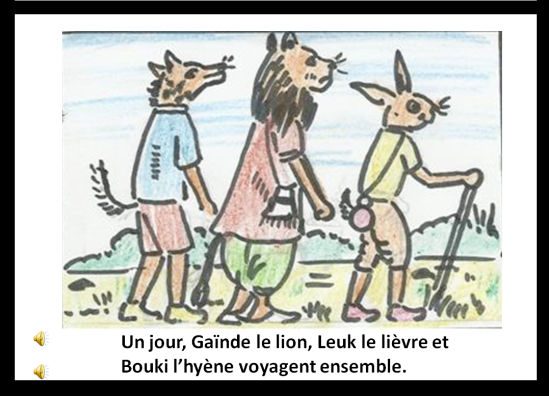 With ongoing teacher-to-teacher support, the content shared in the classroom is guaranteed to align with the Senegalese national curriculum, as well as the teacher’s personal instructional objectives. Relying again on simple, available, and affordable technology, CyberSmart Africa uses SMS to extend our professional development. Every Monday, teachers receive by SMS a “Weekly Challenge” exercise, a follow-up on themes introduced during face-to-face meetings and classroom observations. The challenge may simply require a response to a question, such as “What software did you use the previous week?”. Other challenges may be task-oriented, such as “Co-facilitate a technology-integrated lesson with a colleague this week.” The challenges are designed to both provide direction, and encourage teachers to put their learning into practice. We have found that the challenges are motivating and fun, while also providing CyberSmart Africa with valuable feedback concerning the level of teacher participation. The USAID Education Strategy (2011) intends to leverage ICT to improve reading in primary grades; and we observe that the possibilities to use the interactive whiteboard for reading instruction are seemingly endless. It provides a way to accommodate for different learning styles, as students not only write on the interactive whiteboard, but also read, speak, listen, and even manipulate otherwise static content. 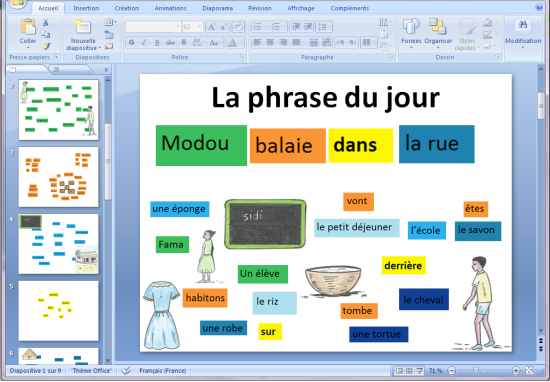 As part of CyberSmart Africa’s Senegal implementation, for example, we have created the framework for a word magnet exercise, where students form sentences by dragging disassociated words, and sometimes images, from one part of the screen to the other. This creative learning exercise sharpens students’ ability to think critically, as they learn sentence construction and vocabulary. With an interactive whiteboard in their classrooms, teachers and their students are not limited to the static content of their textbooks – often in short supply – nor are they obligated to search very far for content presented in different formats – audio, visual, and text. In an effort to produce appropriate localized reading materials, CyberSmart Africa has collaborated with teachers to create various talking books that integrate different learning modalities. With each talking book, students are able to listen to the story, read the text themselves, participate in discussions based on the pictures, annotate the story directly on the interactive whiteboard screen, and more. These stories can be shared among teachers, and enriched and shared again. They present a unique learning opportunity for students who otherwise have little, if any regular exposure to a variety of reading materials. Learning to read does, of course, require practice and ongoing support beyond the classroom. Still, the classroom is, and will be for the foreseeable future, the place where students learn to read. When teachers facilitate technology-integrated lessons directly in the classroom, they can draw from engaging content originating from teachers, the community, packaged software, and other sources globally. 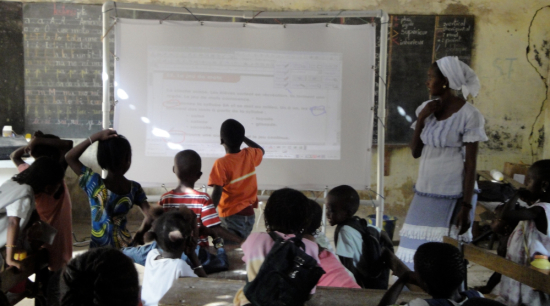 Although use of an interactive whiteboard by no means represents a complete solution for reading improvement, our experience in Senegal indicates that teachers and students enthusiastically embrace use of the interactive whiteboard for active, whole class learning. The approach impacts large numbers of students with minimal equipment, and has the potential to scale because the Total Cost of Ownership is low. Still, it is important to emphasize that teachers need ongoing professional development in order to prepare high quality technology-integrated lessons, and to facilitate an active, learner-centered classroom. With the appropriate support, use of an interactive whiteboard holds tremendous potential to shape the classroom learning environment in Sub Saharan Africa, and globally. Written by Jim Teicher and Sarah Nehrling on October 18, 2011 in Reading Skills in Primary Schools. I was amazed at this solution. I kept seeing that screen and thinking "but this is just a projector with a simple screen"!. I believe solutions like this are innvoative in just the right way. congratulations! I was, however, quite dissapointed with the Cybersmart Africa site. It has very little information about the project, even less than this article. There is no detail of the technical solution, or the TCO. How much energy does the setup consume? how many lumens does the projector provide? what is the software suite used? what are the costs involved? Are they afraid the idea can be copied?? CyberSmart chooses to concentrate on the most neglected aspect of ICT use in education – professional development. Specifically, we focus on the ability to teach meaningful, technology-integrated lessons in support of core subjects. This is typically the missing link in so many ICT for education programs, and is why we do not emphasize technical specifics on our website. With regard to our professional development, we have posted a number of videos on our website, including a day-by-day walk-through of our four-day face-to-face training. The basic technical aspects of our program have publicly available online for nearly five years. The concept of adapting the Nintendo wii remote to configure an inexpensive interactive whiteboard was introduced in 2007 by Johnny Lee, a Microsoft researcher. Please also reference Wikipedia. I also want to point out that there are many alternatives to using the wii remote. With regard to power consumption, this is continually changing based on the availability of new projectors which provide a brighter display while using less power, more power-efficient laptops, and lower cost and more powerful solar panel/battery options. We don’t name brands or discuss technical specifics because we try to pilot all of them. Regarding the projector, we try to keep power consumption below 100W and have gone as bright as 300 lumens. We estimate TCO to at least 50 percent less expensive than the average computer room and laptop implementation, and will be writing more about this. When we calculate TCO it is particularly important to consider the nature and quantity of professional development provided. I believe we also deliver about double the amount of training compared to the traditional approaches; and the focus is to impact instruction by facilitating an active, learner-centered classroom. I too am a big fan of the Cybersmart Africa approach. I think its a great usage model for the $15 teacher laptop and projector hardware model. From that model, I can tell you that when using a Classmate PC and 200 lumen LED projector, the power draw is around 50 watts and all 12VDC, so no inverter needed – just straight DC from a battery. I believe the software is all free or Open Source (with the exception of MS Power Point & Win7). So quite reasonable costs, even at scale. The value that these projector solutions create is a bit like going to a town in a vehicle driven by a chauffeur .. Educomp uses $4 to $5 per month per student model and clearly children like it. But when you compare that to a $6 per student per month model of One Laptop per Child, the gap is transformational, of an order of magnitude and does not require the cost of running a 50 watts or 200 watts energy resource.. Unless of course one has been paid by classmate PC team which is a market solution and has several salesmen touting its benefits locally. Try seeing it for real and not by being a paid spokesperson of classmate PC. Actually the correct analogy would be any laptop per child system as each child driving a car, while the projector model is everyone taking the bus. The latter is much cheaper in real or monthly terms, regardless of the hardware manufacturer. Now one could use an OLPC to be the computer in the teacher computer/projector model, but you have to hack the XO to get a VGA port first. Some I for to hand Wayan is that OLPC Australia now supply a working USB-VGA adapter that allows the XO screen to be sent to a projector. Oops – meant to say 'info to hand' – by the way, I love the car vs bus analogy. Great! I always though the lack of a projector capacity was a great oversight by OLPC. This is a very good and practical method. We certainly wish to know about the entire set up so that it can be duplicated in all rural areas we can reach out to. As the author of this posting it's been interesting to observe the comments prior to reacting. Our goal is to encourage teachers to facilitate technology-integrated lessons in their classrooms. In order for this to happen, there must be a serious commitment to ongoing professional development where teachers learn to facilitate an active classroom with learner-centered pedagogy. This is what's necessary for students to become more engaged participants using the tools under discussion here — for the purpose of meaningful learning. If high quality professional development is not priority #1 then teachers will simply deliver boring lectures with projectors — and I'm sure that none of us want that to happen. I also want everyone to know that the process to create an inexpensive interactive whiteboard has been available free online for years. Johnny Lee, a former Microsoft researcher, presented this innovation at a TED Talk back in 2008. Since that time, numerous "make your own" interactive whiteboard sites have cropped up all over the net. CyberSmart does not focus on the details of equipment integration on our web site because our focus is more on the practical ways to scale technology-integrated learning. The outcomes from professional development and classroom practices drive the technology needs, refine our configuration, and define the TCO. We believe that with scale, TCO with our whole class learning approach is much lower in comparison with school computer rooms and laptops — and that we can deliver substantially more professional development while retaining the cost savings. I'd also like to comment on the use of projectors. I want to add that we find the interactive component to be extremely valuable in the instructional process. Interactivity contributes to a more active classroom. When a student or teacher is manipulating a keyboard they become more focused on the computer itself than the learning content and class involvement. Teachers are also less inclined to have students "mess with their computer" then touch a large screen in front of the whole class.